How much better will life be? How much easier to control weight? Hypnosis and NLP can really help you. It’s pretty easy to come up with a definition of comfort eating. At times you eat to feel more comfortable, and if you are reading this, then those times are probably much too frequent, and you know it. Comfort eating takes your mind off whatever stress or anxiety is going on in your life. Sometimes it gives you a sugar rush, or releases serotonin into your blood (one of the mind’s natural feel-good chemicals – chocolate does this); sometimes it makes you feel calmer, and heavier. It depends upon what class of food you ‘comfort’ eat. Fundamentally, though, it becomes an automated pattern of thinking, feeling and behaving, a thing you do because you did it yesterday: a habit. Stop comfort eating. Why do I comfort eat? Well, it’s a habit, as we have just said. And habits can be changed. It may well be that consuming food like this has become one of your major ways of coping with (or diverting yourself from) stressful feelings or problems, and if so, we will work to help you to make changes that make it easier for you to cope with life’s challenges and problems, to help you to stop feeling so awful and to help you to be more optimistic and positive in the way that you feel. Basically, though, it’s still just changing the ‘habit’ that sorts this out. You are probably well aware of this. Excessive carbohydrate intake and overdosing on sugar do not tend to help people get into the best states of mind. The mood swings caused by big fluctuations in blood sugar, the bad feelings about being overweight and the guilt of eating the ‘wrong’ foods too often aren’t going to help you get on with your life. You know this, of course, yet you still persist in eating these comfort foods. Why? It’s a habit, that’s why. But you can learn to stop comfort eating, and we may be able to help you. We work directly to train your mind to think in ways that allow you to feel better about yourself, feel more resourceful, and to eat more healthily. Our approach combines what we consider to be the best techniques from the fields of NLP (Neuro-Linguistic Programming) and hypnotherapy. It is all about where you are, and where you are going, about helping you to aim your life and your behaviour in more useful directions. It is very pragmatic and to the point (we don’t do counselling). We always aim to be able to make useful noticeable differences within a very few sessions. ‘Weight Control’ can help you to good results so stop comfort eating when played consistently over time. 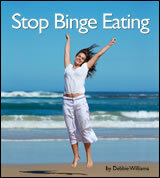 Stop Overeating is yet another excellent self hypnosis recording by Debbie Williams. This recording is highly recommended for all forms inappropriate eating of including comfort eating, compulsive overeating, night eating and emotional eating. By overcoming emotional blockages you will free yourself from binging for good until eating like a naturally lean, happy, healthy person becomes automatic. Daily Mail – An article on comfort eating from this newspaper. Guardian – An article by the Guardian newspaper. Help Guide – This is a detailed article about emotional eating. WebMD – WebMD talks about emotional eating.